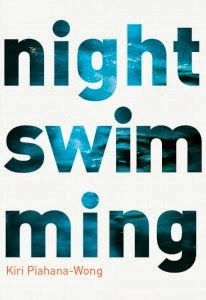 Night Swimming, by Kiri Piahana-Wong (Anahera Press, 2013), 50 pp., $24.99. Ko he pukapuka o ngā whiti tuatahi tēnei nā he kaituhi ki te ingoa o Kiri Piahana-Wong. Ka nui te pai hoki kia titiro me kia rāhiri tēnei pukapuka. Thank you for publishing this, your first collection of poems, Kiri. I was pleasantly surprised. I think that there is certainly enough quality poetry inside the slim volume to warrant the collection too, given the inevitable first collection dilemma of whether or not a poem is quite ‘good enough’ to warrant inclusion. Some poems do struggle a bit to establish themselves either above or beneath the waves here, but there is so much more demonstrably power-swimming going on elsewhere that the book positively waves to you to dive in and wallow. And to publish via your own publishing house (Anahera Press), pushing out into the tide with some moolah from Creative New Zealand flung into the currents, is also an achievement I applaud. Piahana-Wong’s prime fixation (that is, in 15 out of the 30 total poems included) is on a young person’s (i.e. her) relationships that have — generally — gone off the deep end and drowned, and there’s sufficient honest hurt at these many failed hopes and their consorts of dismal males to propel the poems emotionally above and beyond any stylistic stasis; in other words these poems can stand alone on the shoreline, dramatic in their impelled angst — simple, clear, direct. For these are primarily confessional poems. Springy, piquant, right on the button. A near-perfect 9.5 leap from the high board. Even the vision Piahana-Wong has for her publishing house swims against the tide: Its vision is to provide a publication platform for authors writing outside the mainstream…we want to publish these stories, stories that the mainstream media does not always understand, value or appreciate. Kia kaha. Kia toa. Kia manawanui Kiri. There are some more formatting ploys and plays as well here, as for example in the poem You render me where there are two poems going on at the same time, each exemplified by italics and non-italics, while in The things people say, these striations return in a prose- line flow. Precisely-wrought, and saying just enough: I feel the loss. The fact that Piahana-Wong is Maori consolidates further an authentic Aotearoa voice – for throughout the collection we can also scan te reo Māori me ngā whakatauki Māori and sense this writer’s holistic call on the spirits of Nature. Thus the poem Matariki with its echoes of Rona and her interdependence with the Moon, as just one example. VAUGHAN RAPATAHANA is a poet, writer and critic currently teaching in Hong Kong. His novel Toa was recently published by Atuanui Press, and his poetry collections include China as Kafka (Kilmog Press).